April was a good month for Millennial Boss. Traffic was up 33% from March. I published the following 4 posts. I also continued to increase my online income and my social following. Ugh, I reported the wrong income for the last two months! In good news, I actually made MORE than I had reported. I forgot to include the income from LendEDU, which is an awesome student loan refinancing marketplace which allows you to compare interest rates from multiple companies. I earned $280 promoting LendEDU in March and $200 promoting LendEDU in February. It doesn’t make a huge difference but always fun to find money that you didn’t know you had! LendEDU stayed strong for me this month and I earned another $200 from working with them. It feels good to know that I’m helping students get lower interest rates on their student loans. The 6.8% interest rate that I paid for my federal student loans is crazy high and I wish I knew about student loan interest refinancing back when I had them. If you want to see if you can get a better interest rate on your student loans, check out LendEDU here. I also recommend SoFi which is another student loan refinancing company. As of February 2018, I actually recommend SoFi for student loan refinancing for Millennial Boss readers. I wrote a tutorial last year about how I use Tailwind to pin 50 to 100 pins per day. This method saved me major time and effort when compared to pinning manually but it still took hours every week to schedule hundreds of pins. I dropped the number down to less than 50 pins scheduled on Tailwind per day and I have seen no drop in my traffic from Pinterest. Phew! This made my life easier. If you aren’t using Tailwind, sign up using this link and get a free 30-day trial. 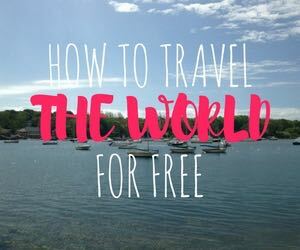 It’s really cheap (only $10 per month after the free trial) and will likely increase your traffic and make your life easier. Blogging is turning out to be a legit side hustle for me. I’m up over $1,000 from my revenue last month and brought in a total of $2663 on the blog this month. The uptick in sales towards the end of the month can be attributed to a pin share in the Making Sense of Affiliate Marketing Facebook group. I signed up for the Affiliate Marketing course back last year and highly recommend it. The course was less than $200 when I signed up and I clearly have had major ROI from it, and continue to get a great ROI from it due to the Facebook group. Michelle (the founder of the course) also regularly updates the course content which I have lifetime access to. Click here to sign up for the Making Sense of Affiliate Marketing Course. If you’re a blogger and want to promote products on your site, I recommend signing up for Flexoffers as a publisher. 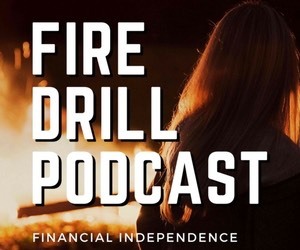 It’s free to sign up and you can find products to promote from all different categories from health to clothing to fitness to financial products. I make the most money from Flexoffers and most of the products I promote are free to sign-up. 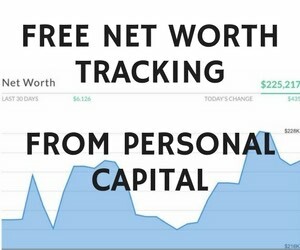 For example, I promote Personal Capital through Flexoffers which is a free app that I use regularly to check my net worth. Sign up here for Flexoffers. I also promote non-Flexoffers products such as Ebates which is a cash back site that I use every time I shop online. I made nearly $40 in cash back so far this quarter and as you can see, I made $160 on referrals. Ebates has it’s own referral program directly through their website. This is not my first blog but it’s my first time making money blogging. I wish I figured this out when I started my first blog almost six years ago. 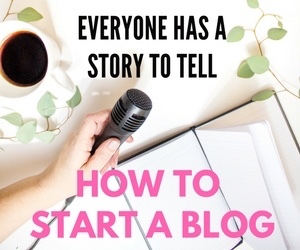 If you don’t currently have a blog but are interested in starting a blog, check out my tutorial on how to start your own website. It’s nice to have extra money coming in each month. It’s also mostly passive. Most of the revenue from this site comes from stuff that I wrote in 2016. I have to admit that I was a little bit bummed out going into April regarding my physical product sales. 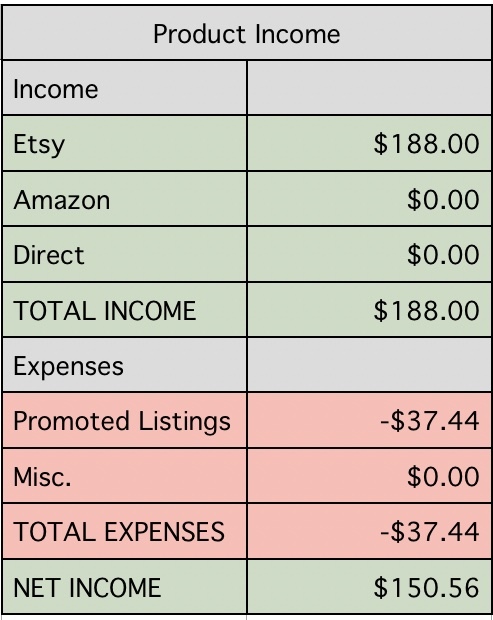 I had spent a lot of money advertising on Etsy in March and didn’t get much return. This last month, I decided to cut the amount of money I was spending on advertising. I only spent $37 this month and made around $42 in sales on promoted listings. I broke even. Although, this means that most of my $188 in revenue came from organic keyword searches which is great. I think I could spend more time optimizing my listings and keywords but my time is very limited. I have not been able to update the listings since the product launch. The good news is that my sales seem to be picking up the first few days of May. I’ve made many trips to the post office this week. Perhaps I don’t need to spend any more time growing the Etsy site and the sales will pick up organically. I’m no longer reporting my rental income in these reports. I want to focus these posts on online income. We either break even or lose a little money each month on our rental property. This property was not purchased for rental purposes (although it’s something I will consider if I buy another house). I didn’t take on any coaching clients this month so there is nothing to report. I’m still taking on coaching clients however. If you would like tips on blogging or to learn more about what I’m doing on Etsy, feel free to sign up for an hour of 1×1 coaching with me. Check out my coaching page here for more details. My social following increased as well. I’m not actively following people anymore but it’s nice to see it grow organically. Overall, April was a great month and I look forward to May. Are you a blogger? Do you have any tips to share? Nice Work J. I do enjoy reading about other bloggers income reports. It gives me hope that I can get there too. Thanks for the inspiration. Thank you! I like reading them too for the same reasons. You have really done a great job getting your blogging income up. I keep meaning to get around to working on increasing the income, but still have not made the time. For me, its a matter of getting more traffic to my site, but the site has been stuck around $250 to $500 a month for the last 18 months. I guess there is also something to be said that my highest and best use (i.e biggest return) has been the day job. Traffic is the key. Pinterest has been a game changer for me. Thanks for the congrats! Your day job progression has been crazy-impressive. Seems like you’re doing all the right things. Thanks for the post! I appreciate how open about the blogging income you are to the people who read and click on the links! Not many ‘business’ owners are as open about their books! Well done on the huge blogging income – really is as much as a full-time job, but without having to report to an unwanted boss! I still like full-time work but it’s nice to have a little extra money coming in each month! Great job, J! These posts are very motivating for me. I haven’t made a cent yet, but I am starting to add affiliate links to my blog. You’ll get there! That was me last year. I’m so happy you post these income reports! Although I haven’t been live a full month to post anything….these give me constant encouragement! 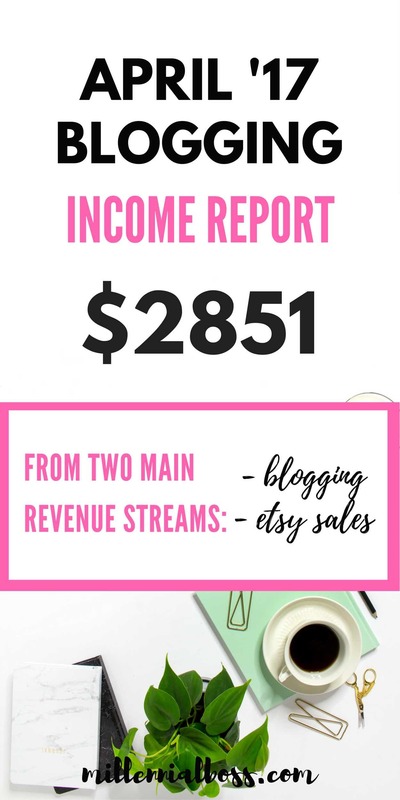 It is interesting to see other Bloggers’ Income Reports, that is kind of Inspiration in Blogging Business, which shows that there is potential to keep Blogging persistently and consistently! I like your Writing skills and presentation. 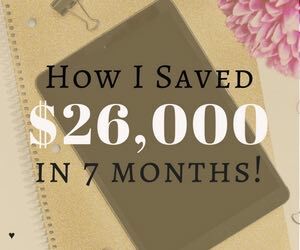 I am also Blogger, who starts her first Blog(Ease Bedding Dot Com) around one and half year ago, which is now making for last one year around $1000 Monthly. Congrats for your Blogging income. Alright girl, this affiliate marketing course must be awesome bc you just sold me on it! Also, regarding your Etsy shop, I think this is AWESOME. However, regarding optimizing it I noticed that you had 1k followers on instagram. I wonder if you could connect the pictures from your esty shop to Instagram and use those same keywords from Etsy on your Instagram as hashtags. Oh and maybe connect it to your site? Maybe that would further your optimization of sales? Haven’t tested the theory out myself but I think I will once my Etsy shop goes up. You got this! Bring on the money! & Great idea about the Instagram hash tags. I try not to mix this audience with the Etsy product audience (definitely different markets) but I do have an Etsy Instagram account and will try the hashtag/keyword idea. Thanks!